I visited a local art market a couple of weeks ago. 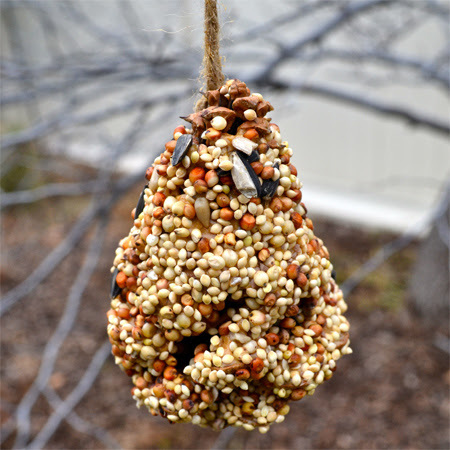 While I was there, I happened to see someone selling bird feeders. 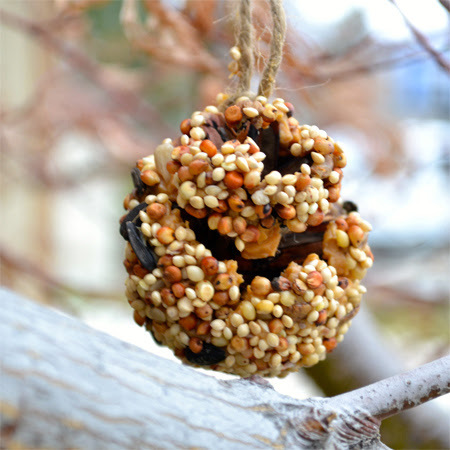 On closer inspection, I realized that they were just pine cones coated in peanut butter and bird seed. I don't know how much they were charging for those, but you know they made them basically for free. Making these bird feeders is a fun activity to do with the kids and it's nice for the birds as well. 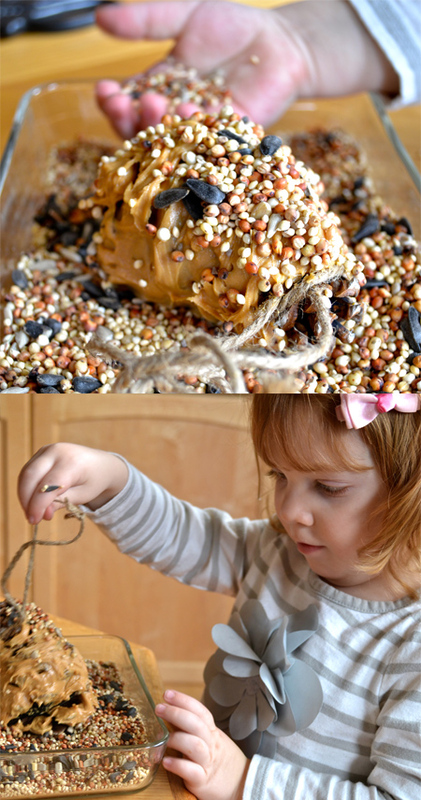 Last year, I made a different type of bird feeder (there are lots of recipes out there), but thought that this would be an easier project for the kids. 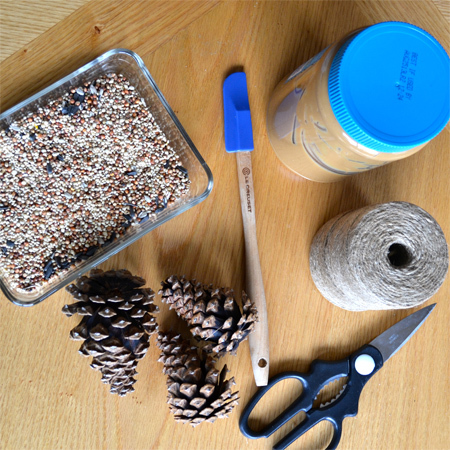 All you need is pine cones, peanut butter, bird seed and twine. The kids and I went to the park to gather pine cones. We gathered them in a plastic sack and then cleaned them when we got home. I knew there would be bugs, but I didn't know how many and how crawly it would make me feel. I put the pine cones in the sink and first cleaned them with dish detergent. I then drained the sink and discovered that there were still a bunch more bugs. (mostly springtails) So, I filled the sink with warm water again and added vinegar to the mix. I let the pine cones soak for a bit then drained the sink and sprayed the pine cones off thoroughly. After all of that, I let the pine cones dry in the sink. While the birds probably wouldn't mind some bugs, I certainly didn't want them in my house and kitchen. yuck. Note: Buddy is wearing a "Super Buy" sticker from the grocery store. He and Jellybean think that Super Buy is the best super hero ever. 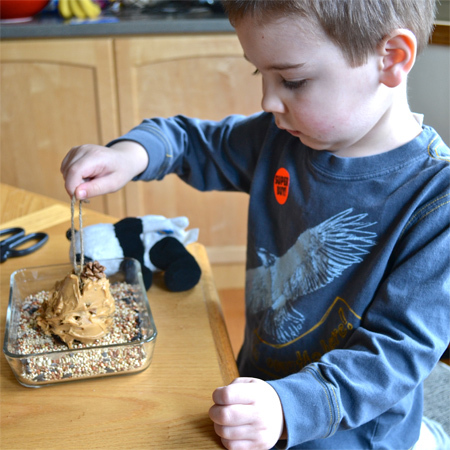 After cleaning the pine cones, I just smeared the peanut butter on them and let the kids go crazy with the bird seed. Jellybean was the best helper. Buddy was done after one. Jellybean helped me finish the rest. Most of them are more dramatic than that, but I had already wrapped them up to give as gifts to neighbors, so I don't have any pictures. How's that for a ridiculously easy project to do with the kids? I hope the birds appreciate our efforts with all of the snow we've been getting. This is such a great idea! Thanks!